Smipal APS series of automatic palletising systems sets a new standard in the palletization of cartons, packs, trays and bundles in general and enhances end-of-line operations in countless sectors: beverages, food, chemicals, pharmaceuticals, detergents, glass, paper and many more. 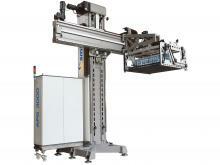 Smipal division's automatic palletising systems offer higher flexibility if compared to traditional palletizers. The central column can be combined in different ways with standard pallet-handling modules, thus allowing the end user to widely customize the palletising system layout in order to adapt it to any end-of-line logistics, for both existing plants and new installations. Smipal's palletizers can be easily fitted in any format, product and/or layout change and can provide different types of palletising patterns, according to the customer's specific needs. The palletising process takes place in multiple phases, requiring the combination of the central column of palletization (1) with different infeed and layer-preformation modules (2): single-entry infeed with simple preformation (2a), double-entry infeed with simple preformation (2b) or double-entry infeed with motorised preformation (2c). 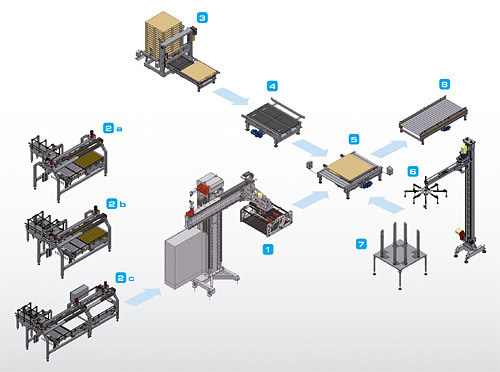 The palletising process also includes: the adjustable fork magazine for empty pallets (3), capable of loading the pallets from both directions and releasing them to the line both headways and sideways; the pallet chain conveyors (4), available in three different lengths; the 90° pallet translation module (5); the interlayer pad-inserting device (6); the pad magazine (7) and the pallet roller conveyors (8), available in different lengths. The APS series of palletising systems can be set in operational motion immediately, as each module is assembled, pre-cabled and tested in Smipal's factory before being delivered. This solution allows to dramatically reduce assembly and start-up operations at the customer's plant. Furthermore, the entire system can be quickly "dismantled", transported and stored in small-sized areas, and then "re-mounted" and started up in less than 3 hours. Mechanical simplicity, use of robotic-like components and an optimised frame allow the end user to cut maintenance costs and energy consumptions drastically, as well as to extend the system's life cycle time. We invite you to assess with our sales department the palletising solution that meets your requirements at best. Further information are available in the Smipal section of our web-site.